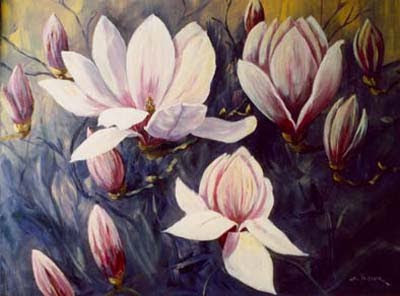 MAGNOLIAS - Artist's Acrylic - 1000mm x 800mm This fabulous large painting is on display at Mainland Finance at 114 Queen Street, Bendigo. You are welcome to call into their offices during business hours to view the painting. Pauline and Geoff and their friendly staff would be pleased to show you. A courtesy phone call would be appreciated on (03) 5444 1995. Pauline and Geoff have several other paintings of mine and some will be featured on this blog over the next few months, so keep up to date and see what is happening with my paintings in the Bendigo region.